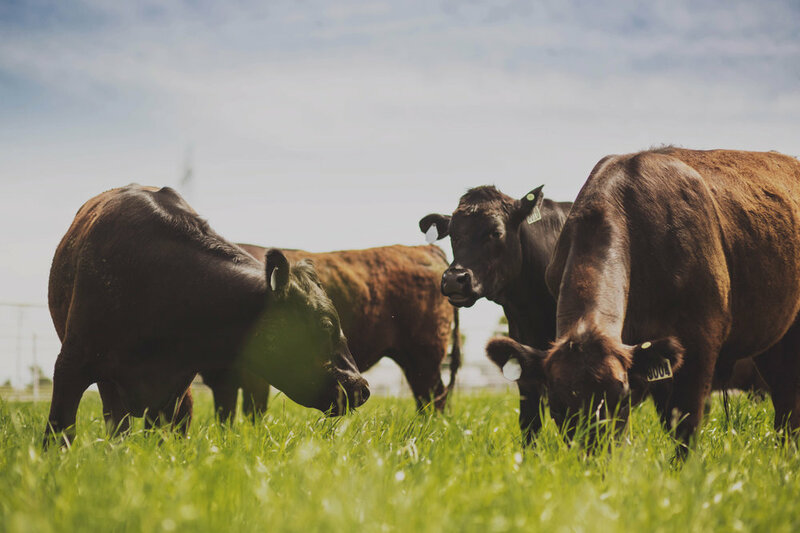 Redhouse is a Central California ranch specializing in 100% grass-fed + grass-finished beef. As one of the only direct-to-consumer grass-fed operations here in Bakersfield, Redhouse Beef aims to keep their wholistic mindset at the center of what they do while educating + serving the community. President Debbie Wise reached out to Purveyor House to help bring their new beef line to life. She and the Redhouse team had the product, a logo + a really great aesthetic in mind. 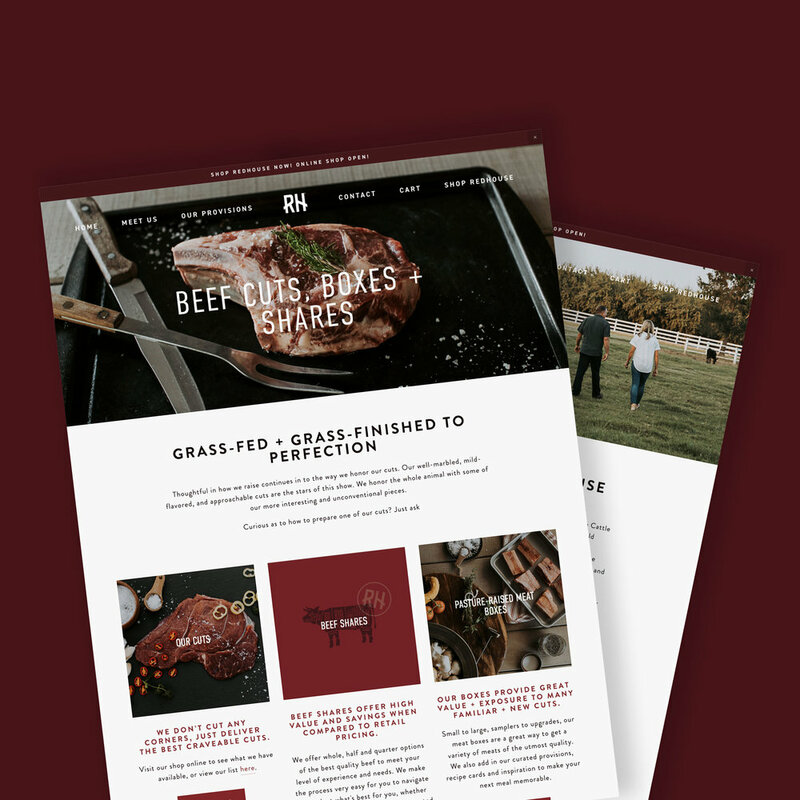 From the get-go, Redhouse Beef wanted to ensure their brand reflected an upscale, bespoke + thoughtful tone in every aspect the consumer would see. They practice a wholistic process with their herd in every life stage, and it was crucial that the brand, messaging, graphics + strategy communicate that in a respectful and elegant way. Our first order of business was to define the direction this brand, vision + aesthetic based on what Debbie wanted to see. We started with mood boards, showcasing the imagery we would need to capture, graphics we would need to create and how we’d bring their stand-alone logo to life. Since we began working with Redhouse, we have built out a two-year brand development plan that coincides with their business goals, revenue models and commitment to building brand recognition + devotion. The first step in our work with Redhouse was to sit down and sort through all the messages and pieces of their process that they wanted to communicate. From there, we built a framework to share the Redhouse story in a way that felt comfortable to them. Starting off with this messaging component has been integral to website setup, marketing and even knowing if a new opportunity is in line with their broader brand vision. Redhouse had worked on a logo design prior to us coming on board. We helped round it out by solidifying a color palette, choosing complementary fonts + meeting photography needs. From the get-go, Redhouse wanted to invest a lot of effort in capturing their process, product + people in authentic photography. Stock photos just wouldn’t do! Over the course of working together, we’ve extended this identity into promotional marketing assets, social media posts, informational graphics, packaging + their website. 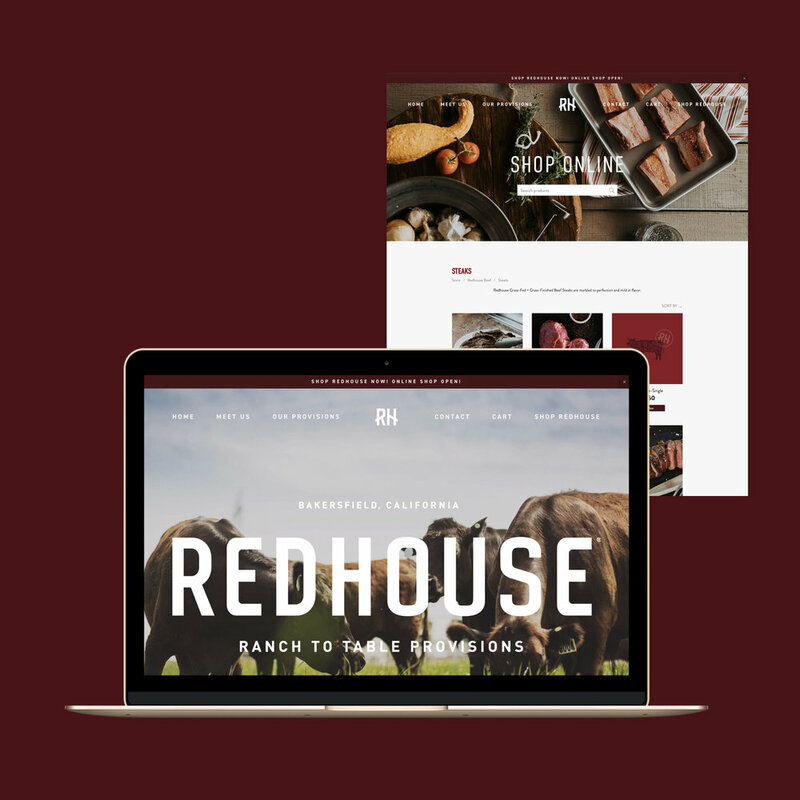 Redhouse serves their customers primarily through their website. Developing their brand through clear messaging has been a great way to tell their story, capture interest and drive sales through their shop. We utilized SquareSpace to integrate with their Ecwid + Clover point of sales systems for a seamless user experience. Their website + online shop features photography captured by handpicked local photographers like Oleander + Palm, Lex & Ev, Jonah + Lindsay Photography and Suyen Torres. We have worked with Redhouse to streamline their marketing efforts and ensure they are on-brand + promoting items in a timely way. Each week, we coordinate, design + share unique promotions to drive traffic to their physical location + website. We built their social media presence on Instagram from less than 300 to now over 2,300 and growing daily. 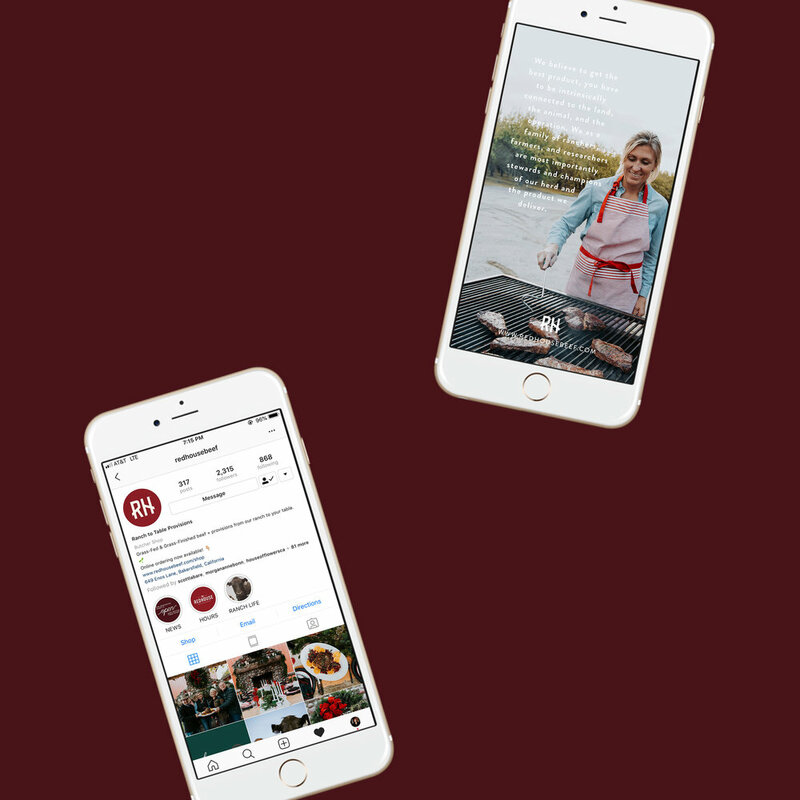 We share newsletters using Mailchimp every week and strive to build a community around ethical processes, shopping local + making healthy food choices. The time devoted to grow, harvest, package + share a product like Redhouse Beef deserves imagery that is upscale and beautiful. In partnership with Oleander + Palm, Lex & Ev, Jonah + Lindsay Photography and Suyen Torres, we facilitated upwards of 6 photoshoots and occasions to capture lifestyle + product imagery to tell the story of Redhouse in a truly authentic way. The photography captured can be seen on Redhouse’s website, social media accounts, marketing materials, collateral + packaging. We leverage these images in designing all of the materials needed to build this brand in a cohesive way. It is an honor to work with Redhouse Beef as their brand grows. From the time we were brought on board with Redhouse, we’ve been able to articulate, apply + share their vision. 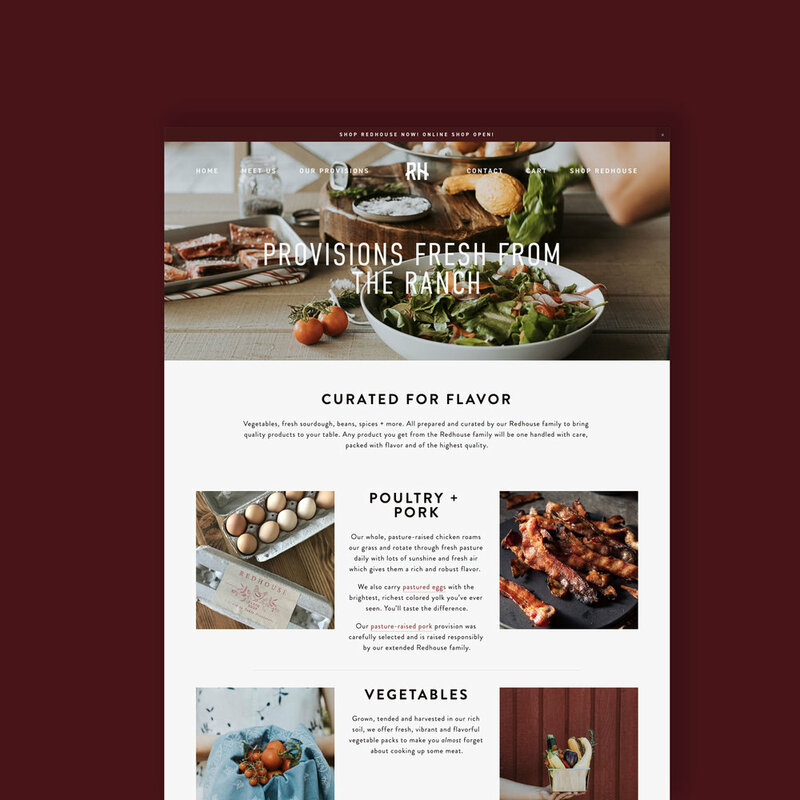 We love working with Redhouse Beef and the creative freedom they afford us—from laying out inspirational instagram grids to providing creative direction on photoshoots to writing website copy to joining them for 2019 business planning with the broad team. We are proactive partners with Redhouse, developing their ideas and providing constant consultation + collaboration to ensure their brand is going in the right direction.